Today Paul and I celebrate 15 years of marriage. I've already blogged about our wedding and our honeymoon so I figured I would toss up some pictures from the years before we were married - when we were just dating. We met during Welcome Week at Baylor, so all of these pictures are from the college years. 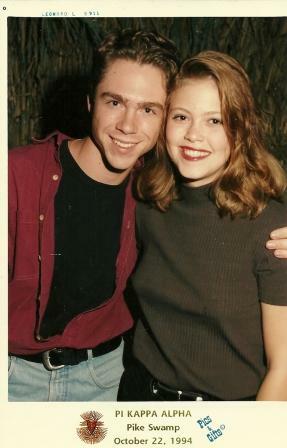 This picture is from Fall, 1993, The Howdy Dance - we'd been dating all of a week or two in this picture. 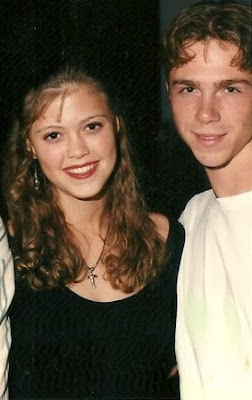 I had to crop out Paul's freshman roommate and his date, because said roommate said about a year later that if he ever saw a pic of said date again he would never forgive me (and he didn't use such nice words at the time). In fact, I think he may have suggested the ritualistic burning of the picture, but I refused. So I'm guessing he probably doesn't want it up on the internet, even all these years later. 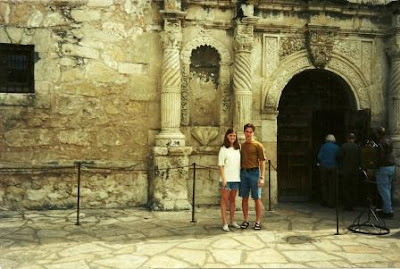 January 1994, taken in front of the Alamo. Another Baylor dance - 1994 - if you look really hard you can see the Alico building in the background. 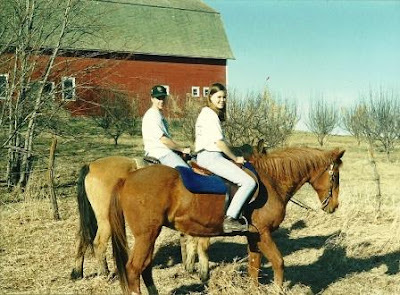 I went to Nebraska for Spring Break 1993 freshman year with Paul, to meet his family. This is the house where he grew up. How cool is their barn in the background? I have a great many pictures from football games. Yes, I am wearing a beret. I was all cool like that, LOL. 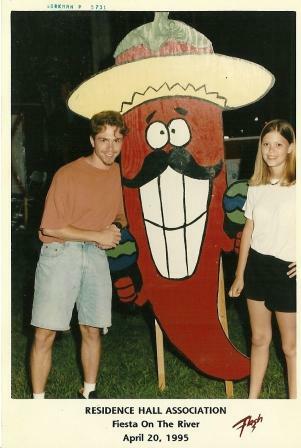 Fiesta on the River, spring of 1994. 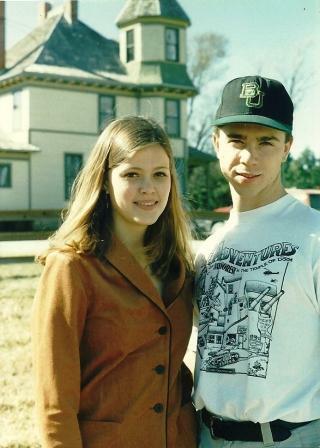 I think this is my favorite picture of Paul and I. Gosh we were so young! We didn't do Greek life at all, but we did like to go to this dance. Fiesta on the River, spring 1995. Fiesta on the River was just a fun little campus event with games and socializing on the river. You could buy virgin (Southern Baptist college folks) margaritas and all sorts of yummy Mexican food. I loved seeing pictures of your dating years. Isn't it amazing how quickly time passes! Oh and happy anniversary! 15 years is huge! Congratulations on your years together!!!! Congratulations and happy birthday to the twins too! Those are great pics. Aww, Happy Anniversary!! Great pictures...it's so fun to look back isn't it? P.S. My dad lives in Nebraska...he's a HUGE Cornhuskers fan. wonderful! 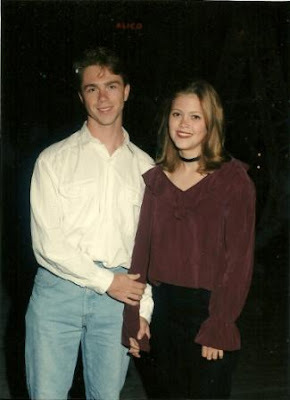 you were the cutest couple on campus, of that i have no doubt! happy anniversary to you both, and many, many more! How sweet! You two look so meant for each other. What a great journey of your courtship years. Happy Anniversary! May you have many more wonderful years together! Happy anniversary to you both - I loved seeing your pictures. You both were so cute and young and you still are! What a great post!! Very Happy Anniversary to you two. Great pictures! You guys look so incredibly young!!! Like babies!! Happy Anniversary! Congrats on 15 years Lisa (& Paul)! & happy anniversary!!! I want to wear a beret! Your photos are precious-you do look so....young. I wish you many, many more years of happiness together. Hey, you're already talking like you are both geezers! NOT!! You still have so many more wonderful, youthful days ahead of you, and that is what I wish for you! You two are beyond cute!! Paul is just dreamy, and I bet you were a cheerleader, or at least prom queen! HAPPY ANNIVERSARY!!! I hope you have fun plans?? You too look so young. Well, you were young. You two were the cutest couple on campus! 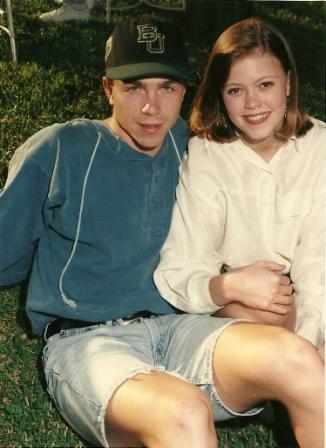 Love Love Love these pictures, Lisa... You are are so cute together... Congrats on 15 wonderful years!!!!! Hope you get 15 plus 15 plus 15 plus 15, etc. MORE together. Hope you had a Happy Anniversary and may you have many, many more! Happy Anniversary!!! ADORABLE! 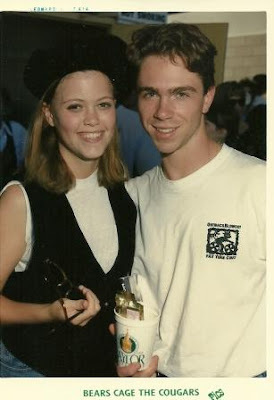 you were looking a little Reese Witherspoon sometimes... we did college at exactly the same time. :) In some ways it feels forever ago, and in others- only yesterday, doesn't it? I loved your pictures! You both are so cute together. I think I need a beret. Happy anniversary!!! Love these. Now off to copy & paste the recipe below this post that just caught my eye. What a cute couple! Happy 15th Anniversary! When I look at photos of us way back I think whew we were babies LOL. I read your wedding post :O), you looked lovely! Your dress was really pretty. We did the Justice of the Peace, just me and honeyman. Two witnesses from the JPS office (we did not know) lol and the JP. We got married in our jeans and boots. We didn't want the stress or expense of a wedding either. :O). You two are adorable in all of these pictures. I love that quote. It's true. Happy Anniversary my friend! Congratulations, I wish you many, many more happy years. Happy anniversary! May it be a year full of many blessings! Congratulations! My husband and I have been together for six years now and it is always surprising to me how much time has passed. We are greatly looking forward to each anniversary! I appreciated seeing all the pictures of you two as you were dating - they remind me of the pictures we have. Now I'm going to have to go flip through some nostalgic photos. Thank you! Beautiful couple. So sweet and cute. Happy Anniversary! It was fun walking down memory lane with you! Happy anniversary!!! I am a little late...Great photos! Congrats! I was just scanning some of our wedding pics today. It's amazing how we survived. You look like us...mere babies! Happy Anniversary! Wishing you many more happy years together. It's great to meet young. You will forever cherish those memories. Well congratulations! We'll be hitting 20 in April. Jeez, were we ever really THAT young? LOL! It's kind of fun to look back - but WOW, where did the time go - right? Happy belated anniversary! I love all the pics you shared!